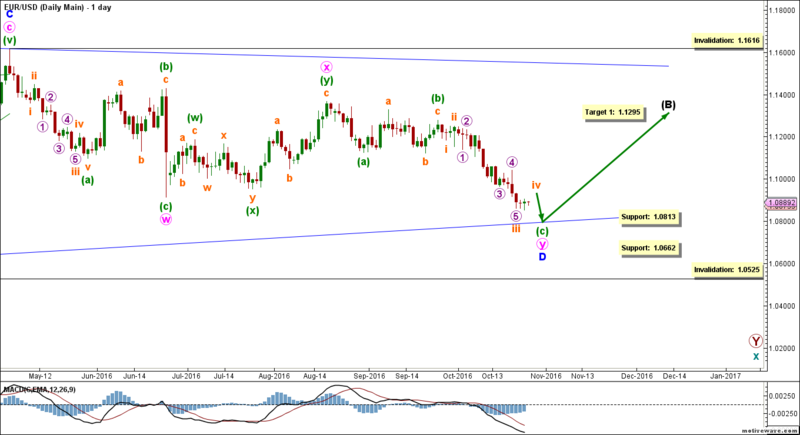 GBPUSD: Elliott Wave Weekly Road Map! On our previous analysis the main count expected Cable to unfold downwards and Cable continued to consolidate in a sideways manner. This week, both counts -presented on the daily chart- have almost equal probabilities and the main count expects Cable to unfold downwards within a fifth wave. On the other hand, the alternate count expects Cable to unfold upwards to complete a fourth wave. Elliott Wave chart analysis for the GBPUSD for 26th October, 2016. Please click on the charts below to enlarge. N.B. : This count is presented on the daily bar chart for clarification purposes. This countexpects that primary wave B maroon is complete and that primary wave C maroon is unfolding towards the downside. Within minor wave 3 blue, this count expects that waves i and ii pink are complete and that wave iii pink has started unfolding downwards. Within wave iii pink, waves (i) through (iv) green are likely complete and wave (v) green is underway. Based on a thrust out of a triangle we have a first target at 1.1831 and at 1.1721 wave (v) green would reach equality with wave (i) green and at 1.1693 wave iii pink would reach 0.786 of wave i pink. This count would be invalidated by movement above 1.2333 as wave e orange may not retrace more than 100 % of wave c orange. It is worth noting that the invalidation point should be moved to the end of wave (iv) green once we have confirmation on the daily chart that wave (v) green is unfolding downwards. The alternate count expects that within intermediate wave (3) black, waves 1 through 4 blue are complete and that wave 5 blue is underway. Within wave 5 blue, waves i through iii pink are complete and wave iv pink is unfolding as a zigzag correction with waves (a) and (b) green complete and wave (c) green has started unfolding upwards. This count would be confirmed by movement above 1.2484. At 1.2515 wave iv pink would reach 50 % of wave iii pink and at 1.2596 wave (c) green would reach equality with wave (a) green. This count would be invalidated by movement above 1.2915 as wave iv pink may not enter the price territory of wave i pink and as well this count would be invalidated by movement below 1.1970 as within wave iv pink wave (b) green may not retrace more than 100 % of wave (a) green. 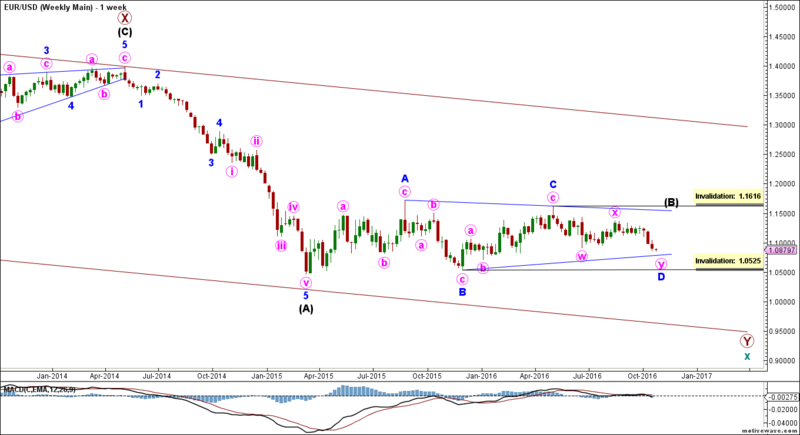 EURUSD: Is That It For the Euro? Probably Not Just Yet. After a clearly bearish couple of weeks — not to mention a bearish recent history in general — it’s only natural to assume that the euro has lost the game and the U.S. dollar is back in power. And yet, our preferred count suggests the euro is about to enter a period of recovery, where it will regain between 300 and 500 pips of its value over the span of several weeks, maybe months. On the other hand, the possibility that a new downtrend has begun and is here to stay can’t be dismissed, and our alternate count examines the long-term consequences if that happens. P.S. : I’m really sorry about the bad audio quality. I accidentally broke the mic right before recording, and I had absolutely no time to replace it. Black wave (B) is forming a contracting triangle labeled blue waves A through E.
Blue wave D is forming a double zigzag labeled pink waves w, x and y. Within it, green wave (c) is forming an impulse labeled orange waves i through v, reaching over 161.8% the length of green wave (a), and it should be very near completion. Within it, orange wave iii formed an extension labeled violet waves 1 through 5 and reached 423.6% the length of orange wave i. 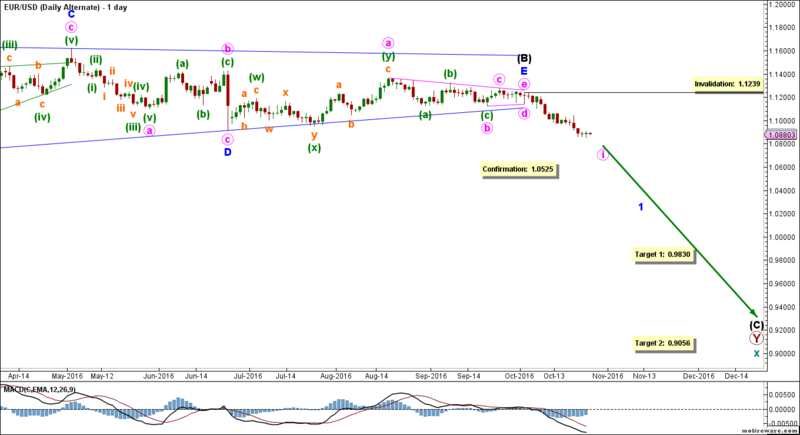 Price is likely to hit a bottom between 1.0813 and 1.0662. At 1.0813 pink wave y would reach 78.6% the length of pink wave w, then at 1.0662 it would reach 100% of its length. Blue wave E will likely form a zigzag labeled pink waves a, b and c.
This count expects the euro very soon to move towards the upside in blue wave E to complete black wave (B). This will be largely confirmed by movement above 1.1123, although final confirmation will be by movement above 1.1239. At 1.1295 black wave (B) would retrace 23.6% of black wave (A). This wave count is invalidated by movement above 1.1616 as blue wave E in this contracting triangle may not move beyond the start of blue wave D. It is also invalidated by movement below 1.0525 as blue wave D may not move beyond the start of blue wave C.
This alternate daily count sees that black wave (B) is complete and black wave (C) is unfolding. Black wave (B) formed a contracting triangle labeled blue waves A through E, retracing very nearly 23.6% of black wave (A). Within it, blue wave E itself formed a contracting/barrier triangle labeled minute waves a through e.
Black wave (C) is likely forming an impulse labeled blue waves 1 through 5. Within it, blue wave 1 is likely forming an impulse labeled pink waves i through v.
This count expects the euro to move towards the downside in black wave (C). This will be confirmed by movement below 1.0525, although it already becomes much more probable by movement below 1.0662. At 0.9830 maroon wave (Y) would reach 100% the length of maroon wave (X), then at 0.9056 black wave (C) would reach 61.8% the length of black wave (A). This wave count is invalidated by movement above 1.1239 as pink wave ii may not move beyond the start of pink wave i.